John B in 2008, John B in 2016! BELMOPAN, Sun. Jan. 31, 2016–The sprawling Belmopan Comprehensive High School campus was the battleground for a historic People’s United Party (PUP) national convention to elect a new PUP leader out of a three-way race. Hon. Francis Fonseca, the Freetown area representative who had resigned from the post of PUP leader in the wake of the PUP’s general election defeat, was the first to announce a slate of candidates who campaigned under the slogan: “Forward with Francis,” after he had announced his surprise re-entry into the race for party leader. 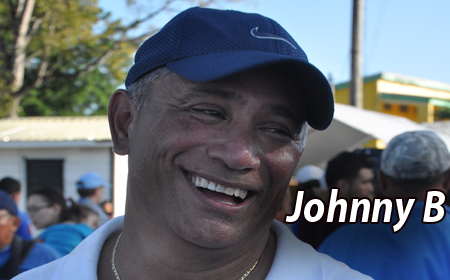 As night fell on Belmopan and the counting rooms were buzzing with activities, word began to leak out that John Briceño was leading the race for leader of the PUP, while Francis Fonseca and Cordel Hyde were trailing behind. By the time outgoing Secretary General Myrtle Palacio made the announcement official that John Briceño had won the leadership race, that information was almost anti-climactic, because it had already been echoing across the country and was all over the internet. Briceño had garnered 1,125 votes, putting him at the top over Fonseca’s 918 and Hyde’s 673. Under the party’s amended Constitution, there will be four Deputy Leaders, representing the central, north, west and south regions. There was, however, only one contested race for Deputy Leader of the south. That spot was captured by Stann Creek West area representative Hon. Rodwell Ferguson, who defeated Hon. Mike Espat, the Toledo East area representative, by a whopping 1,558 votes to Espat’s 1,044. The post for Communications Director was captured by Anthony Mahler, who polled 1,485 votes to defeat Dolores Balderamos Garcia, who got 1,103 votes. 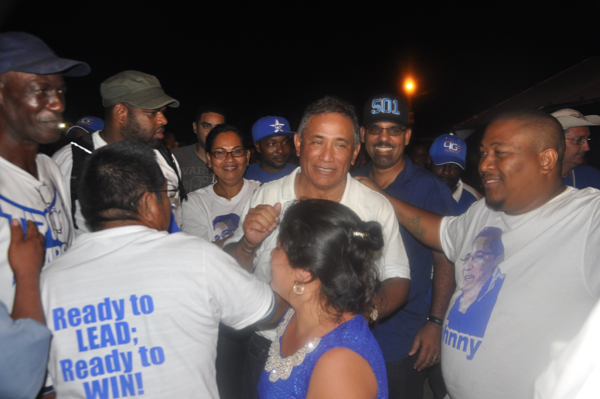 PUP Chairman Henry Charles Usher was returned to the post with 1,444 votes, defeating Hon. Oscar Requeña, the Toledo West area representative, who received 1,162 votes. That sentiment about the party returning to its winning ways was expressed magnanimously by Hon. Cordel Hyde today in a post on his Facebook page, congratulating Briceño and his team and pledging his full support. Hyde wrote, “I congratulate the Hon. John Briceño and his team on their victory. You have my full support. I will make no excuses. I will ascribe no blame. We fought as hard as we could for as long as we could. But it was not to be. I believe in the will of people. I always have and I always will. I give thanks and praises. I salute all those persons who believed in me against all odds. On this journey, I have made some friendships that will endure for the rest of my life. And I found added hope in unlikely places. I honour the 673 persons who voted for me on Sunday. You gave me your hearts, and I will continue to honour your support in my voice and deeds. We fought; we struggled; we lost. But we are not beaten. We remain ever committed to the principles and purposes for which we fight. Struggle, for me, has always been a glorious thing. The people have spoken. Now it’s time to heal the wounds. The road ahead will not be easy, but it’s a road we must travel. The hope lives on…The People’s United Party must return to its winning ways. Uniting the party and winning the next general elections are the formidable tasks awaiting the newly elected leader, Briceño, who, like Hyde, has been among the dissenters of the PUP from as early as 2005 when he was among seven Cabinet ministers who formed the so-called G-7 rebellion, and then again just last year, Briceño teamed up with Hyde and ten other standard bearers to bring pressure to bear on Fonseca and his executive to hold a contested leadership convention. Briceño described his opponents, Hon. Cordel Hyde and Hon. Francis Fonseca, as formidable candidates. “But the people have spoken and we respect that,” he said. “Now I am going to reach out to everyone individually – Hon. Francis Fonseca, Hon. Julius, Hon. Cordel Hyde, and everybody. I want to tell them let’s forget our differences. The PUP is not a social party, it is a political party and we want to serve the people, and we can only do that by winning elections,” he said. Briceño also said that he will reach out to Hon. Fonseca as well. Briceño said that when he took over the party in 2008, his efforts to secure financing for the party were undermined, but under the leadership of Fonseca, the PUP was being run on a “bare bones” budget, so he does not think that it will be difficult to raise funds this time around. “With me at the helm it will be easier to raise funding, because they know that we are going to form the next government,” Briceño declared. The convention process involved almost three thousand delegates, selected from the 31 electoral constituencies and who were bused in from all across the country to vote in the three-way race to select the new PUP leader and to fill other top executive posts. As the morning hours rolled into the afternoon, delegates formed a single very long line which snaked around the campus and into the streets, decorating the landscape in PUP blue-and-white colors. During the last Briceño leadership, there were all kinds of intrigues involving the assets of the PUP. Briceño himself was forced to rent office space in Belize City, because there were ownership issues about Independence Hall, which is the party’s headquarters, and the party’s organs, The Belize Times newspaper and the radio station Positive Vibes. Newly elected Communications Director Anthony Mahler said that the work really starts tomorrow, because they have lost every single election since 2004. Mahler said that the PUP needs re-branding. “It’s not about Old Guard or New Guard. We have to be on the people’s side at all times. The people have spoken and they are saying that they want change. We have to get back to our winning ways,” he said. PUP Chairman Henry Charles Usher thanked his opponent, Hon. Oscar Requeña, for the hard work that he had done. Usher said that it will take a lot of work to get the PUP back to Belmopan. Usher also said that all of the persons who operate the party’s communications organs will have to be evaluated for the work that they have done and such an evaluation will be considered as they form a policy that will guide the way forward.